“If management can really pull off 5-10% pricing growth next year [as it is suggesting] and stable truck count with even a modest OR improvement, the stock deserves to be meaningfully higher than current levels,” he wrote. Knight-Swift (NYSE: KNX) stock closed up 52 cents Wednesday at $30.72, and was up another 47 cents in afterhours trading to $31.19. 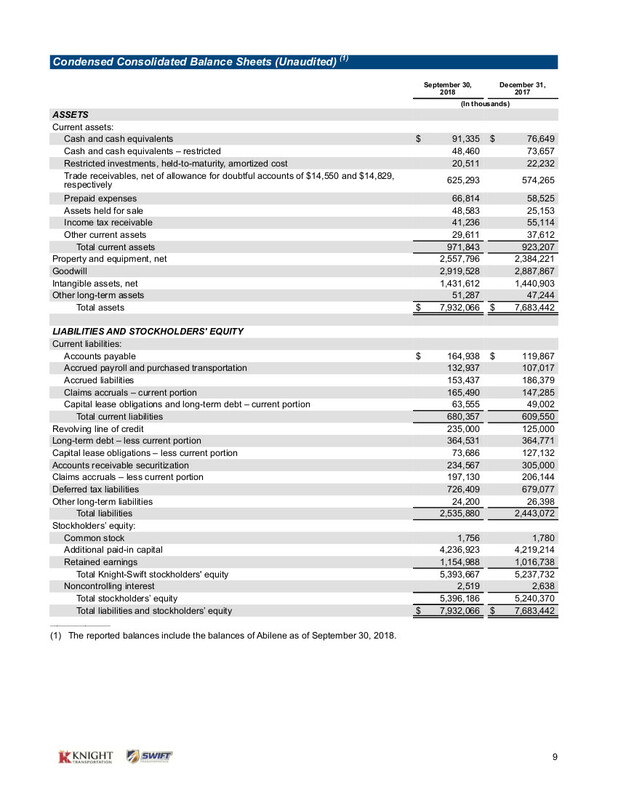 Knight-Swift reported net income of $105.9 million and adjusted net income of $115 million. GAAP earnings per share was $0.60 per diluted share for the third quarter compared to $0.04 for the third quarter of 2017. Adjusted EPS was $0.65 for the third quarter compared to $0.25 for the third quarter of 2017. Morgan Stanley estimates were for $0.57 adjusted EPS. The company reported its trucking segments operated on an adjusted operating ratio of 84.9%. It also said that the “stabilization of the Swift tractor fleet” continued into the third quarter. That fleet now has 14,779 operational tractors. “We achieved sequential progress in the Swift Refrigerated segment’s adjusted operating ratio, which was most pronounced in September 2018, and we expect to continue to see further progress into the fourth quarter,” the company said. That division saw additional leadership added in the quarter with a focused effort on improving the division. The result was an adjusted operating ratio of 95.6% in the third quarter, down some 240 basis points from second quarter’s 98%. Average revenue per tractor within the Swift Refrigerated segment increased 6.1% in the third quarter of 2018, compared to the second quarter of 2018. Revenue per loaded mile, excluding fuel surcharge, increased 7.6% on a sequential basis, while miles per tractor remained relatively flat. Knight-Swift said total revenue increased 158.2% to $1.3 billion for the third quarter of 2018, up from $521.6 million for the third quarter of 2017. Revenue, excluding fuel surcharge, increased 153.1% to $1.2 billion for the third quarter of 2018 from $469.7 million for the third quarter of 2017.
operating income increased to $144.3 million for the third quarter of 2018 from $5.8 million for the third quarter of 2017. Adjusted operating income increased 255.6% to $156.5 million for the third quarter of 2018 from $44 million for the third quarter of 2017. Swift Intermodal posted a 17.7% year-over-year improvement in revenue per container, excluding fuel surcharge, while revenue per load increased 18.1%. Load counts increased 2.3% year-over-year. The segment’s adjusted operating ratio improved from 95.6% to 90.9%. Swift Dedicated also posted an improvement, with its adjusted operating ratio dropping to 84.9% from 85.4% in the second quarter. Contract rate increases of 4.6% led to a 0.5% increase in average revenue per tractor, although miles per tractor declined 2.9% compared to third quarter 2017. Swift Truckload also improved its performance in the third quarter, with its adjusted operating ratio improving 290 basis points to 84.5%, compared to 87.4% in the second quarter. On a year-over-year basis, average revenue per tractor increased 4.2% in the third quarter of 2018 compared to the full third quarter of 2017. This increase was primarily driven by a 19.9% increase in revenue per loaded mile, excluding fuel surcharge, as a result of year-over-year improvements in both our contract and non-contract rates. The company noted that it has emphasized improving revenue per tractor in the fleet which has led to a change in freight mix, a shorter length of haul, and 11.1% fewer miles per tractor. Part of that focus has been right-sizing the fleet, with the number of Swift tractors in operation down 21.3% year-to-date to 7,612 and trailer units down 12.8% year-to-date at 30,779. While the Swift tractor and trailer counts are down year-to-date, Shanker pointed out that management said driver growth is up for seven consecutive weeks and truck count increased 0.2% in the third quarter. “This is a critical waypoint that investors have been looking for to verify the stabilization of SWFT post-acquisition and is an important positive development,” he said. On the Knight side of the operation, the Logistics segment lowered its adjusted operating ratio to 90%, from 93.5%, and revenue, excluding intersegment transactions, increased 55.4%, contributing to a 141.5% improvement in operating income. Brokerage revenue increased by 60.6% in the third quarter of 2018 when compared to the same quarter in 2017, as revenue per load increased 7.1% and load volumes increased 50.1%. The Trucking segment particularly benefitted from the tight capacity market and strong freight environment, as average revenue per tractor increased 22.2% and revenue per loaded mile increased 19.9%, excluding fuel surcharge and intersegment transactions. There was also a 2.8% improvement in miles per tractor in the quarter, which all added up to a $29.4 million improvement in adjusted operating income and an adjusted operating ratio of 77.8%, compared to 85.9% in the same quarter a year ago. Combined, the Knight-Swift trucking segments comprised approximately 18,900 tractors. “We continue to see meaningful improvement in operating profitability in our trucking segments, as a result of our focus on improving our yields, increasing revenue per tractor, and continuing to improve on our ability to source and retain drivers without compromising our commitment to improving safety,” the company said in its earnings report. The company said expected adjusted EPS range for the fourth quarter of 2018 is $0.71 to $0.75, up slightly from its previously announced $0.68 to $0.72, and expected adjusted EPS range for the first quarter of 2019 is $0.50 to $0.54.